Definition at line 58 of file llfloaterscriptdebug.h. Definition at line 77 of file llfloaterscriptdebug.h. Definition at line 157 of file llfloaterscriptdebug.cpp. Definition at line 163 of file llfloaterscriptdebug.cpp. References LLView::addChild(), FALSE, LLRectBase< Type >::getHeight(), LLRectBase< Type >::getWidth(), LLFLOATER_HEADER_SIZE, LLFLOATER_HPAD, LLFLOATER_VPAD, mHistoryEditor, LLView::mRect, S32, S32_MAX, LLFontGL::sSansSerif, TRUE, x, and y. Definition at line 207 of file llfloaterscriptdebug.cpp. Definition at line 212 of file llfloaterscriptdebug.cpp. References LLTextEditor::appendColoredText(), FALSE, LLUUID::isNull(), mHistoryEditor, mObjectID, LLFloater::setCanClose(), LLFloater::setCanTearOff(), and LLFloater::setTitle(). Definition at line 248 of file llfloaterscriptdebug.cpp. Definition at line 184 of file llfloaterscriptdebug.cpp. References LLView::addChild(), FALSE, LLRectBase< Type >::getHeight(), LLRectBase< Type >::getWidth(), LLPanel::init(), LLFLOATER_HEADER_SIZE, LLFLOATER_HPAD, LLFLOATER_VPAD, mHistoryEditor, LLView::mRect, S32, S32_MAX, LLFontGL::sSansSerif, TRUE, x, and y. Definition at line 229 of file llfloaterscriptdebug.cpp. 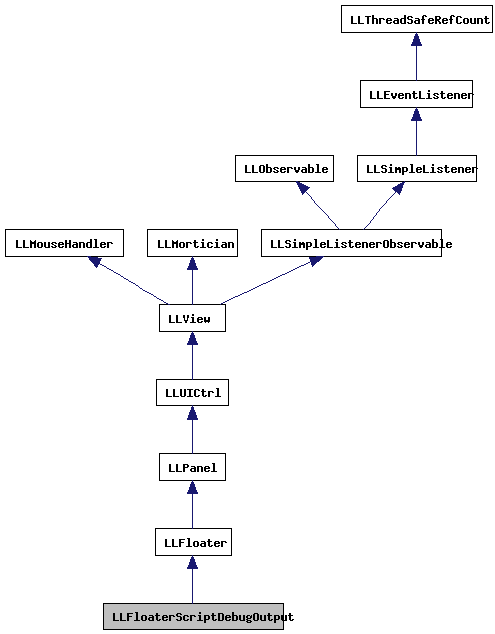 References LLFloaterScriptDebugOutput(), NULL, LLFloater::open(), and sInstanceMap. Definition at line 75 of file llfloaterscriptdebug.h. Referenced by addLine(), init(), and LLFloaterScriptDebugOutput(). Definition at line 80 of file llfloaterscriptdebug.h. Referenced by addLine(), LLFloaterScriptDebugOutput(), and ~LLFloaterScriptDebugOutput(). Definition at line 78 of file llfloaterscriptdebug.h. 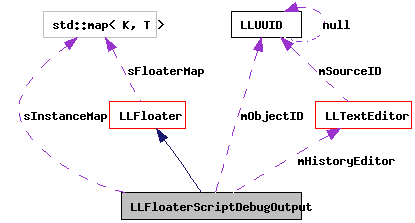 Referenced by getFloaterByID(), LLFloaterScriptDebugOutput(), show(), and ~LLFloaterScriptDebugOutput().